2006-02-17 First worldwide family litigation filed litigation Critical https://patents.darts-ip.com/?family=27482172&utm_source=google_patent&utm_medium=platform_link&utm_campaign=public_patent_search&patent=EP1247651(A3) "Global patent litigation dataset” by Darts-ip is licensed under a Creative Commons Attribution 4.0 International License. 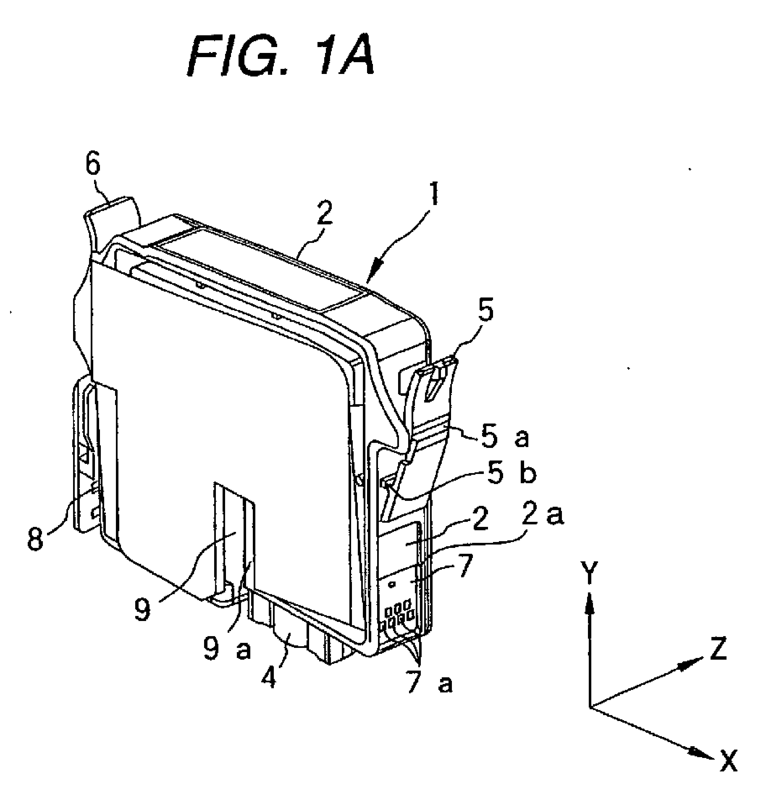 An ink cartridge constituted by: a container storing ink therein and having an ink supply port (4) in a leading end side in an insertion direction of the container; memory means (7) disposed on one of opposite surfaces parallel with the insertion direction of the container, the memory means having an electrode connectable to the recording device; a retaining member (5) disposed on the one surface and located at a trailing end side relative to the memory means in the insertion direction, the retaining member being capable of being engaged or disengaged with the recording device; and another retaining member (6) disposed on the other surface and capable of being engaged or disengaged with the recording device. US696916A (en) * 1899-11-09 1902-04-01 Everett F Morse Apparatus for gaging temperatures of heated substances. ZA200205842B (en) 2003-11-04 Cleaning sheets comprising a polymeric additive to improve particulate pick-up and minimize residue left on surfaces and cleaning implements for use with cleaning sheets.